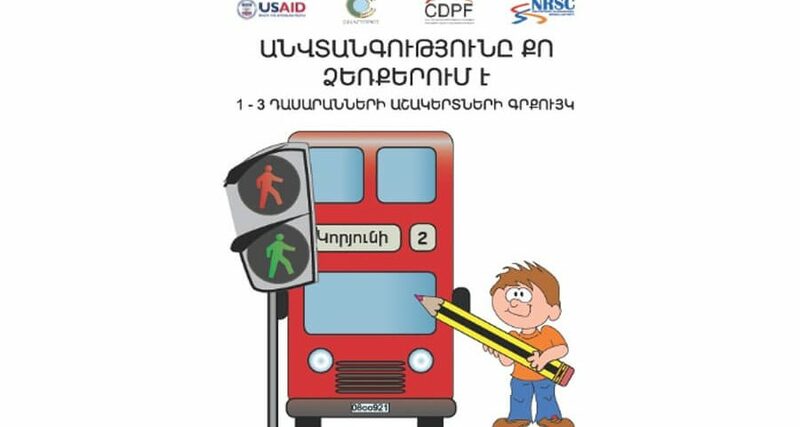 The current project was the next logical step directed to reach the goal of NRSC- inclusion of the “Road safety” subject, as compulsory, in the curriculum of schools of Armenia for 1-11 classes by 2010. Believe that the education on the Road Safety is important and must be provided at early ages started from schools and even kinder gardens to teach children the basic traffic rules and the ethics that the road users shall have to each other in 2008-2009 NRSC continued the implementation of “Safety is in your hands” educational pilot project covering 1-3 grades in 15 schools of Yerevan city. In the frameworks of the project colorful booklets of A4 format and manuals for teachers of A5 format were designed and published which were also approved by National Institute of Education under the Ministry of Education. Pupils of 15 schools with the knowledge of road safety rules, and also indirect beneficiaries – schoolmates, who didn’t take part in the lessons, but became aware by the word of mouth and visual material published on the wall. The knowledge of traffic safety rules will help our children to become conscious citizens, who will know tomorrow the right behavior and the ethics in complex road environment. Having the necessary theoretical and practical knowledge children will be more attentive while crossing roads and will know the basic traffic signs to safeguard their lives.